It’s the top of the British dinner charts, the tradition which is at the heart of British cooking. It’s the food which brings families across the country together on Sundays. 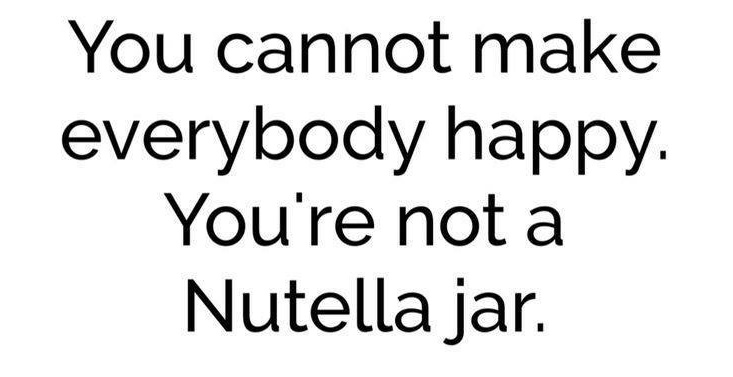 It is, of course, roast beef. 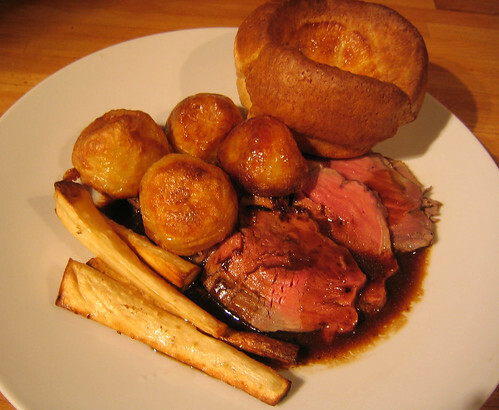 Served with crispy roast potatoes with fluffy insides, golden Yorkshire pudding and gravy made with the beef juices it is the ultimate Sunday lunch. For the very best use rib of beef. It is more expensive but it really is worth it. Rub the beef with olive oil, salt and pepper. Add to a roasting tin with a quartered red onion for the gravy (you can also add chopped carrots and celery) then put into your oven at 240c, for 20 minutes (15 minutes if the rib weighs 1.5kg or less). After this time turn the oven down to 190 and cook for a further half hour per kilo. These timings will give rare beef, which is how I like it, but cook for longer if you prefer. For your roast potatoes cut them into the size you want. I like them quite large so tend to just half the potatoes if they’re medium sized. Par-boil them in salted water then drain and shake them up a bit to rough up the edges. This will help to make them crispy when they roast. Make sure the fat you use to cook your potatoes in is very hot before you add the potatoes. Just add it to a roasting tin and heat it in the oven while they are par-boiling. Beef dripping is great to roast potatoes in, making them really tasty. I tend to use the healthier olive oil for every day roast potatoes but I keep beef dripping in the fridge for a Sunday roast like this. When you add the potatoes turn them in the fat then cook until they are crisp and golden, turning during cooking. They’ll take about an hour, but once the beef is cooked and you’ve taken it out of the oven you’ll probably want to turn the heat up to crisp the potatoes up. Peel and quarter parsnips lengthways and add them to the fat in which the potatoes are cooking, turning in the fat as you did with the potatoes and again turning during cooking. They don’t take as long as the potatoes so add them when the potatoes are about half-way cooked. 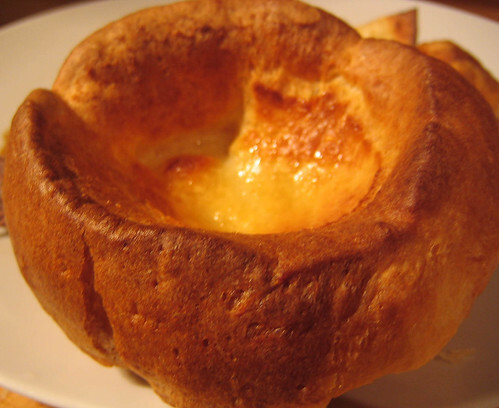 Mix up the Yorkshire pudding batter by beating 4 eggs then adding 225g flour, 300ml milk and a pinch of salt and beating until smooth. Leave to rest. I reckon this amount will make up 6-8 puddings, depending on the size of the tin you use, so half the amount if necessary. Once the beef is cooked leave it to rest for 10 minutes at the very minimum and up to half hour. Cover it with foil to keep it warm. 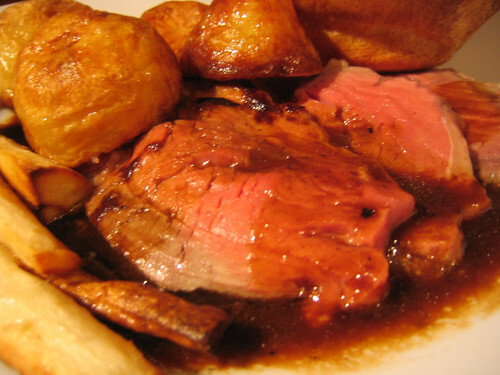 While the beef is resting cook the Yorkshire puddings and make the gravy. Add some fat from your roast potato tray to the tray in which you’re going to cook the Yorkshire puddings. Turn the oven up to 220 and put the tray in the oven to get the fat hot, then add the batter and put in the oven for about 20 to 25 minutes until they are risen and golden. Don’t open the oven door until they are ready or they may collapse. Make the gravy with the juices left in the roasting tray and the onion (and carrot and celery if you’ve used it). Put the tray on the hob and remove most of the fat except for about a tablespoon, then add a tablespoon of flour and stir well whilst cooking. Once it looks like a sludgy mess add beef stock and a slosh of madeira, red wine or port. Simmer to reduce. And there you have it, the traditional British Sunday lunch.